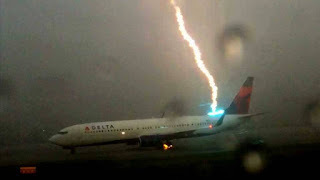 This Is Your Captain Speaking: Is Getting Hit By Lightning in an Airplane a Bad Thing? Is Getting Hit By Lightning in an Airplane a Bad Thing? Delta Airlines has been having a rough go with the weather lately. I wrote about a Delta jet's encounter with hail last week, and this week they're back in the news for a rather dramatic lightning strike caught on video. Actually, everyone has had a time of it with the weather this past week. I even had to divert to San Antonio yesterday as Houston, our destination, was beset with thunderstorms. So this past Tuesday afternoon a passenger was filming a lineup of airplanes waiting out a storm in Atlanta when a bolt of lightning struck a nearby 737. The shot shows the lightning hitting the fuselage while a simultaneous discharge jumps from the landing gear to the ground. Now here's the crazy part. The airplane, scheduled for a 5:45 departure, subsequently took off for Las Vegas with only about a two hour delay according to flight tracking websites. Why, you ask? Well, they probably didn't even know they'd been hit. A two hour delay in Atlanta is considered more or less on time, and the airport was on a ground stop due to the storm. Had they suspected a lightning strike, the prudent thing to do probably would've been to return to the gate for an inspection. Even so, the flight had no problems and landed uneventfully. So, is getting struck by lightning in an airplane a big deal? I won't say that it's a non-event or even routine, but no, it's not any particularly big deal. As most airplanes are made of metal, which conducts electricity, the vast majority of lightning strikes pass completely through the airplane with little or no evidence that there was even a strike. We have lightning strike checklists which direct checks of things like compasses, communications radios and navigation systems to make sure everything is operating as it should. That may be changing slightly, though. As aircraft construction moves away from aluminum to composite materials, provisions will have to be made to accommodate lightning strikes. Electricity doesn't flow willingly through those new materials. Boeing's new 787 Dreamliner, for instance, is comprised of about 50% composite materials with carbon laminate and carbon sandwich making up most of the fuselage and wings. More on that later. In over 30 years of flying, I've been struck by lightning perhaps two or three times that I remember. On one particular flight in a C-5 cargo jet, we were struck by lightning on the nose of the aircraft. How did I know it was the nose? That's because there was a small hole blown in the radome which we found after landing. Remember, lightning likes to travel through metallic structures. The radome is made of a composite material designed to allow radar signals to pass. The experience was more or less what you'd expect. There was a bright flash simultaneously accompanied by a loud crack of thunder. As we were already in the pattern, we thought it best to land. Another artifact of flying near storms is St Elmo's Fire. No, I'm not talking about a tedious 1980s coming-of-age flick, but rather the phenomenon first noted by ancient mariners of static discharge in their sails. As static electricity builds up in the atmosphere due to moisture, discharges can take the form of a blue light which sailors would attribute to the presence of their patron saint, St. Elmo. This form of discharge is occasionally visible today on the windscreens of airplanes flying in clouds at night as seen here (fast forward to the last minute). It's a little unnerving the first time you see it, but it's really harmless. Airliners have small rods known as "static wicks" attached to the trailing edge of the wings and tail to drain built up static charges off of the aircraft before they can build up. Even still, the voltage required to produce St. Elmo's fire is on the order of 1000 volts per cm. How is it that the people inside an airplane aren't cooked by lightning? Michael Faraday, a scientist and an early experimenter with electricity, noted back in 1836 that for a hollow conductor holding a charge, the charge existed only on the exterior of the conductor and that the interior of the conductor held no charge. Faraday cages, essentially grounded metal enclosures, are used to insulate sensitive electronic components and computers from electromagnetic interference and lightning. The fuselage of an aluminum aircraft behaves in a similar manner, directing the current from a lighting strike along the outside of the airplane where it jumped the gap between the metal gear strut and the ground in this instance. So How About Those Composite Materials? Ok, so getting back to the new airplanes using composite materials, how are they protected from lightning strikes? The answer is the old fashioned way...with a metal enclosure in the form of a metallic screen or foil embedded in the composite material. There's simply no way to get around this requirement as composites, essentially laminates of synthetic materials such as carbon fiber, do not conduct electricity. They actually have a nasty tendency to simply blow apart when subjected to the high voltages present in lightning. Engineers have to make sure the embedded mesh has the ability to conduct the amount of electric current expected from a lightning strike while also attempting to keep the weight as low as possible. That's the whole point of using composites. Other considerations such as potential corrosion or chemical interactions between the mesh and the composite materials must be considered. Repairs on such materials will not be easy either. Should a ramper run the belt loader into an aluminum skinned plane, a new piece can just be riveted on. Repairs to composite structures will be time consuming and expensive. Time to Worry About Lightning? No. Airplanes made of composite materials have been flying for decades with few problems from lightning. Composites are only just now making their way into commercial airliners, but the knowledge base of how to mitigate lightning strikes in composite structures is mature. Boeing estimates that each commercial airliner flying can expect an average of one lightning strike a year. That's a lot of lightning strikes, but other than the occasional fortuitous photograph bringing the issue up, it's really nothing to lose sleep over. How about you? Have you ever had a much too close encounter with lightning? I'd love to hear about it.